While searching for great Mother’s Day gifts, I found some ideas products that make wonderful bundling gifts. Would your recipient love to rip open the gift and find accessories tucked around the main event. Your grilling gift recipient probably continually seeks improvements on technique. Smoke & Spice: Cooking with Smoke has some secrets to share. They’ll really love it bundled it with the Mr. BBQ 12″ Non-stick Grilling Skillet. It keeps whatever they’re cooking in one place and out of the coals. Includes removable handle. The Mesh Nonstick 3-in-1 Grill Pan also makes a fantastic partner gift. A deep grill basket, skillet and covered basket all in one for excellence on the grill. buddy gift with either or both of the gift ideas above. Makes marinading easy. Includes marinade and grill trays. After grilling, they’ll rinse and use the grill tray to bring in the bounty. The Chelsea Flatware might be the perfect gift. How often do we keep old and/or mismatched utensils? Gifting four of the 5-piece settings will cover them for the more intimate dinner parties. At this great price, you might double that for an excellent shared gift. Several of the natural Linen Flatware Pouches, bundled with flatware, would make a welcome gift bundled. A red ribbon adds to each place setting. Put your recipient’s stamp on these colorful mini casserole dishes. Personalized with the beneficiaries name in block or script letters. Perfect for singles or two-serving portions. For a larger group, gift several for various casseroles. Goes from oven to table. Pair the casserole dishes with Bamboo Kitchen Tools. The 6=piece set–3 spoons and 3 spatulas–comes in mesh bag. The Red Bird Vintage-Inspired Oven Mitt makes a perfect accompaniment to the mini casserole dishes and the spoons. Might want to gift a couple at this great price. If they have enough spoons, substitute the Ruffle Bird Vintage-Inspired Apron in the bundle. The strategically placed applique and ruffled bodice might especially appeal to Mad Men fans. Prepare these gift recipients for dinner parties or just dinner at home. Check it. Your gift recipient will get use the Chefs Kitchen Towel and Oven Mitt Set for a long time. Coordinating, durable quilted mitts and towels made of waffle weaves. Clean it. The Progressive Collapsible Over Sink Dish Rack leaves their counters clear and dishwashers off. Stores flat. Dry It. The recipient will appreciate the thick, absorbent 3-piece Cuisinart Basket Weave Terry Kitchen Towel Set. Can you ever have too many kitchen towels? Pick a few. or all, of the pieces to put in a beautifully decorated box, a spectacular basket or a (your creativity kicks in here). One, or several, of the Bread & Oil Servers will look great on their table for guests to enjoy pre-dinner and dinner bread. Bundle the server with a couple of delicious loaves of their favorite bread. The entertaining recipient might find the CHEFS Catering Dinnerware useful as the go-to dishes solely for the occasions and events. This glazed set comes in custom boxes for easy segregation. Works great as housewarming gifts, too. Especially if you pair this dinnerware with colorful glasses as a counterpoint to the pristine white of these porcelain beauties. Comes as individual sets or a full set. Singular or group bundling partnership! Also great as a housewarming gift. Combine the Catering Dinnerware with the Schott Zeiesel Cru Glasses and Decanter, either as a singular or group gift. Your recipient can use this classic, stylish 6-pc. set before, during or after dinner. Made of Tritan Crystal. Your entertaining gift recipient might also appreciate the Riviera Bamboo Short Serving Set included with one of the salad, or the entire, dinnerware sets. Include a Yoga Mat Bag ($16 $20) and Yoga Socks ($17) to complete the gift and complement your gift recipient’s workout. 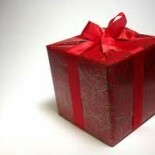 What do you think of using sales/clearance opportunities to get more bang for your gift giving with bundling? Do share why or why not. MAY YOU FIND JUST THE PERFECT GIFT! This entry was posted on May 15, 2014 by frugalistagiftguide in Bundling, Cook, Entertaining, Household, Sizzling Sales/Bargains, Uncategorized and tagged bargains, bundle gifts, cook, entertaining, Frugal, Frugalista gifts, Gift, gift shopping, grilling, housewarming, sizzling deals.